Seven degrees below zero Fahrenheit, and a foot of snow. Spread out her picnic blanket and begins to unpack her feast. She has arrived early. We take this as a gift, for our winter will be shorter this year, heading south to summer again in January. The forecast predicts the “real” cold comes tomorrow. A rude awakening, they say. If you weren’t ready for winter, you will find it regardless. It will find you. 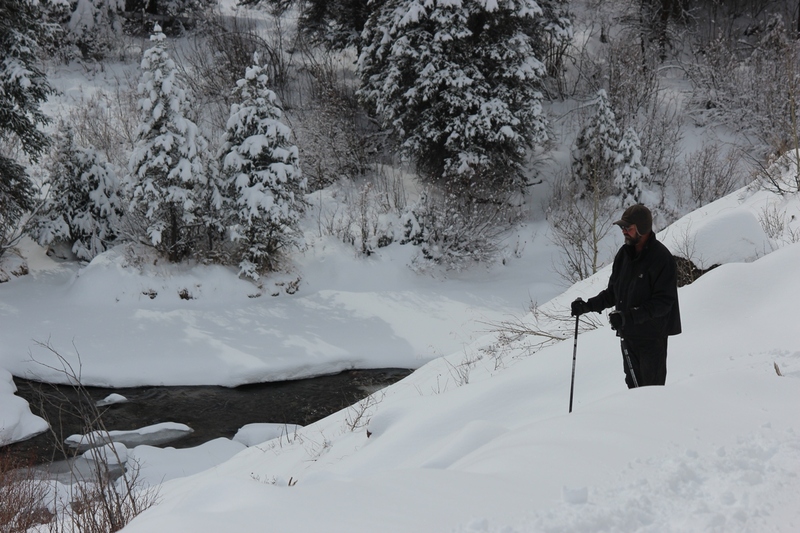 Yesterday we took the afternoon off (the weather providing a wonderful excuse to not work) and snow-shoed along the other side of the Rio Grande in virgin snow, looking back at our mountain, white again, horses and houses tucked into the snow laced trees, seemingly so little and far away. And I think of how far away another person today might be. Any one else. Miles away. And you know I find comfort in such distance. 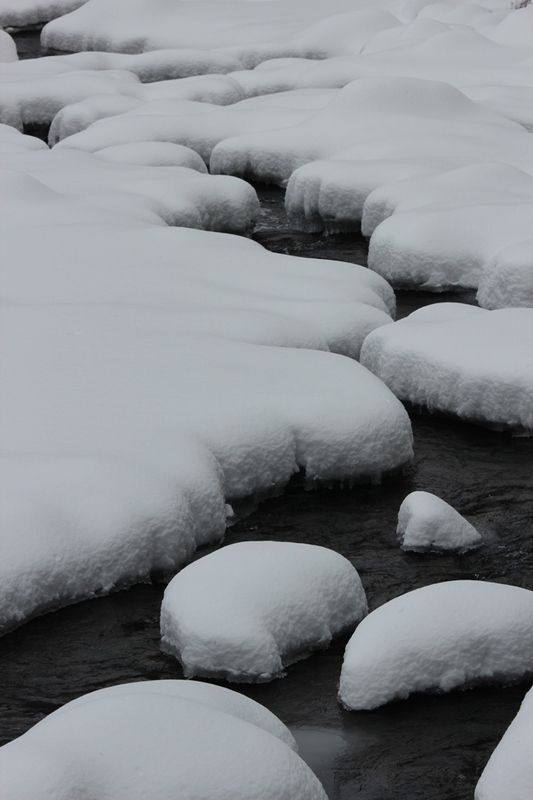 We follow the hillsides like waves, and again cross the river, now where she is open and as yet, still unfrozen. That will come in time. Many more mornings like today and it will not take long. For now, however, there are no black depths lurking through solid white, but rather, she calls quietly and shows me her brown and green rocks at her soothed soul, and invites me to step in. Snow shoes and all, we walk through the water. All we can do is hope waterproof boots are just that, for turning back the way we came on our first trek of the season that proves more extensive than planned is not what we want to do. You know how it is. Once you start, you just keep going. It’s so crazy beautiful. You just can’t get enough. Until all of a sudden, you had too much. And then you find yourself… exhausted. And still with a ways to go to get back home. The boots proved tight, our crossing worked well. Except on the other side the wet boots and snow pants coated with dry snow, packing thicker with each step, and became quite heavy. The two mile trek back up the snow packed road seemed very long indeed. We feed the horses double in the storm. Three times their normal rations last night. Icicles on their muzzles this morning. Norman’s furry feet dangled with little snowballs, jingling almost joyously as he lifts his heavy feet to come find me feeding this morning before sunup. 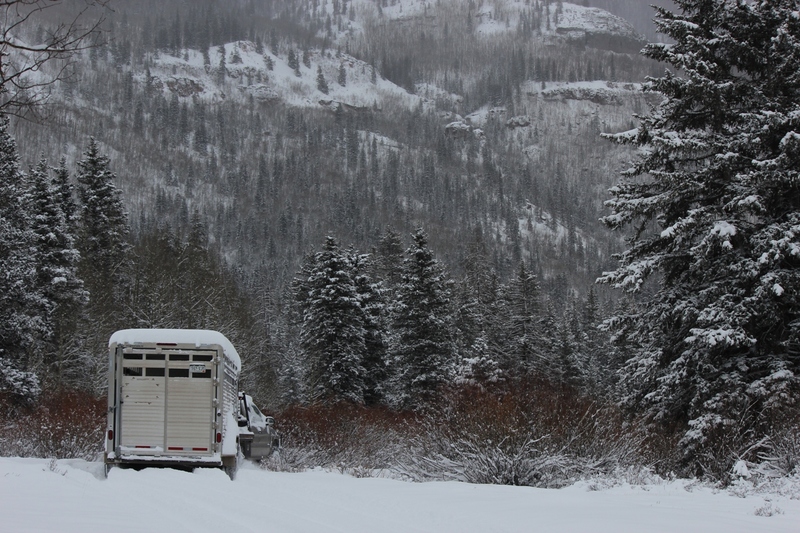 Yesterday morning in the thick of the storm, watching Bob take the horse trailer down the road before it got snowed in. 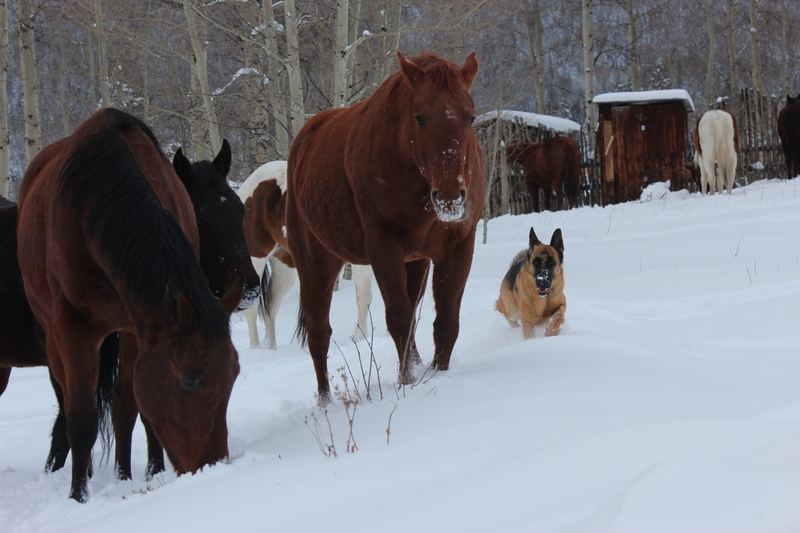 We can ride the horses out when I am ready to part with them and allow them their winter pasture in lower lands. They might be ready, but I am not. Those that have spent most of their winters up here with us (Crow, Canella, Tres, Bayjura) do not find it odd to weather the storm and hunker down as the snow coats their backs. They hide in the Aspen and gnaw the bark of the freshly dead trees while waiting for Gunnar and me to show up for their next feeding. This morning the last of the elk have left their tracks across our pasture as they scramble for open grounds. Now we enter the time of depth, physical challenge, silent connection, intimacy with the elements, isolation with earth and sky. Alone need not mean loneliness. For some of us it is a state of awakening. An opportunity to flourish. A quiet radiance. 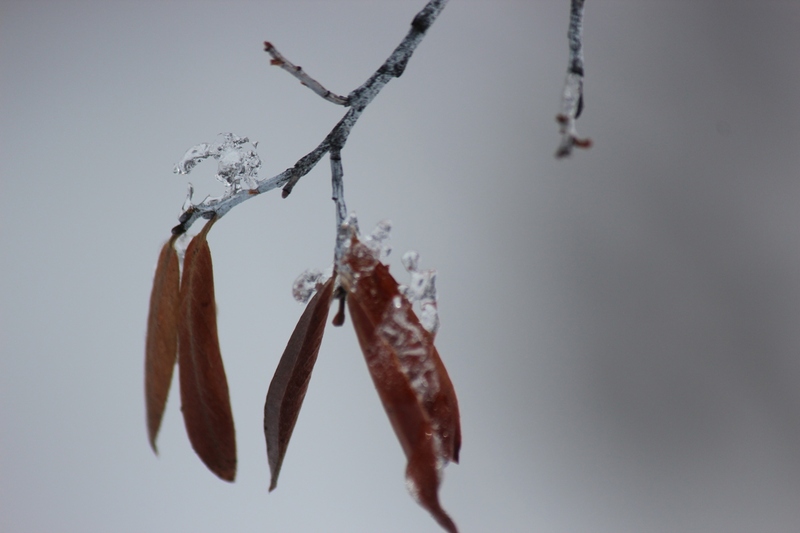 The winter crystals bloom so brilliant, though are more fragile. Both created by and at the mercy of the sun. Exposed to the elements of which they are a part. So delicate in nature, so susceptible to the whim of man. “And I think of how far away another person today might be. Any one else. Miles away. And you know I find comfort in such distance.” I smile when I read this because this is what I long for so often. Ron will laugh if he sees this comment because he knows how true it is! Oh and I can picture the little “snow balls” on Norman’s feet because Willie gets them all in his feathers when we are blessed enough to get snow. They aren’t easy to get out, either…just have to let them melt. 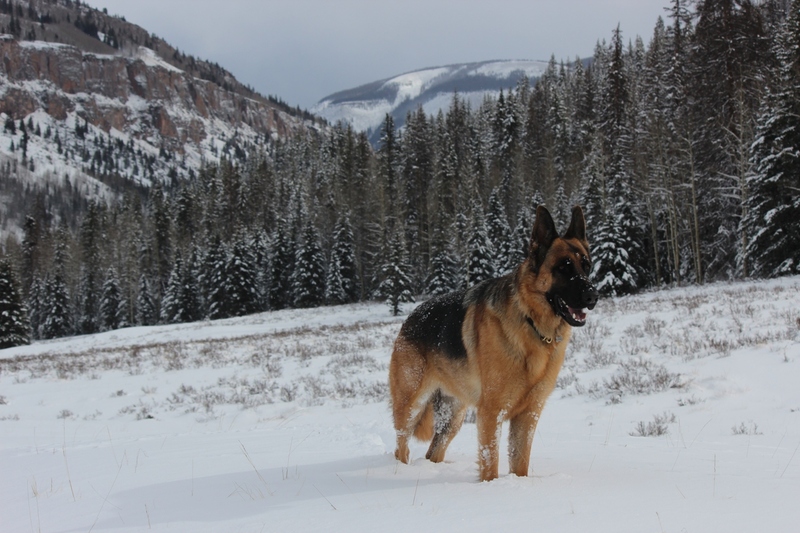 I am quite sure he is loving every minute of it, though for he was made to live in the cold and wet. Love this Gin. I can picture myself there. Great photos. I don’t know how it is possible to part with these beautiful beasties. I’m so glad the little Arab began his coat in August! We are still unseasonably warm…don’t know what’s coming this year! Although the prairies are really getting hit with snow and winds. BTW – I asked a couple who sold a farm and love adventure if they’d like a stint in the mountains, but alas, newborn twin grandchildren have taken their time, attention and love of adventure! It’s been a number of years since I’ve seen snow like that – all soft, rounded and virginal as it covers Nature’s and man’s sins. 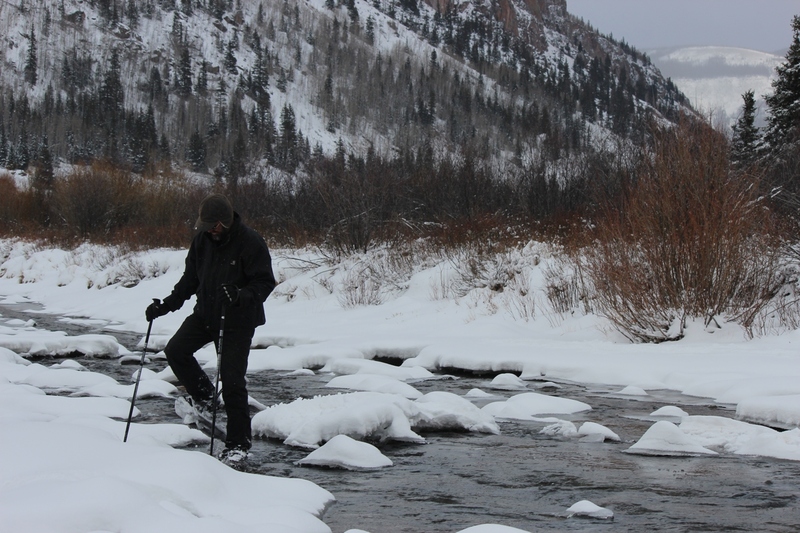 I had never thought of snowshoeing through water. Thank goodness there were no leaks in the footwear…that would have been a mean trek home!